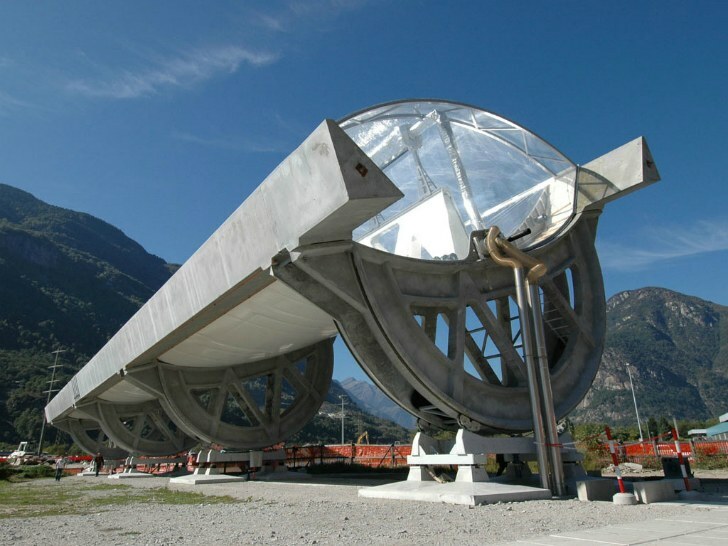 Concentrating solar power (CSP) is slowly gaining traction as a viable base load power source and this new design from Swiss firm Airlight Energy is a wonderful example of what the future of monolithic solar troughs could look like. Made from precast concrete and flexible pneumatic mirrors, Airlight's CSP troughs are both heavy-duty and super-light. After a few years of research & development, the firm is set to commercialize their technology anywhere in the world by making use of local materials and labor for the trough base. By inflating their special air pillow mirror, they can achieve a near perfect parabolic trough with higher solar concentrations at a much lower cost than traditional mirror technology. Airlight Energy began developing its concentrating solar power troughs back in 2007 and has also been working on concentrating photovoltaics, which they recently finished testing. Both their CSP and CPV are both ready for commercial development and make use of a rigid precast, fiber reinforced, concrete frame. This frame tilts on a single axis to follow the sun throughout the day and maximize on the solar resource. To build a system, Airlight manufacturers and transports the critical components, i.e. the pneumatic mirrors, but the concrete frames are fabricated locally. This minimizes transports of heavy goods and gives a boost to the local economy. The concrete frames are also more durable and longer lasting than other frame systems available. Each system features a multi-arc pneumatic mirror made from a long lasting transparent ETFE foil on the upper side, a silicon fibreglass fabric on the bottom side, and a flexible mirror foil (made of polyester film with a reflective aluminized mirror coating on upper side), which is well protected inside. By inflating the air pillow, Airlight is able to create a near-perfect parabola at a lower cost compared to companies who need to manufacture highly precise mirrors. The air pillow also protects the mirror from dust and dirt and can maintain its shape under heavy wind loads. The ETFE foil has self-cleaning properties, which means less maintenance for the operating crews to keep the system clean, further increasing the energy efficiency. Airlight Energy began developing its concentrating solar power troughs back in 2007 and has also been working on concentrating photovoltaics, which they recently finished testing. Both their CSP and CPV are both ready for commercial development and make use of a rigid precast, fiber reinforced, concrete frame. This frame tilts on a single axis to follow the sun throughout the day and maximize on the solar resource. To build a system, Airlight manufacturers and transports the critical components, i.e. the pneumatic mirrors, but the concrete frames are fabricated locally. This minimizes transports of heavy goods and gives a boost to the local economy. The concrete frames are also more durable and longer lasting than other frame systems available. Each system features a multi-arc pneumatic mirror made from a long lasting transparent ETFE foil on the upper side, a silicon fibreglass fabric on the bottom side, and a flexible mirror foil (made of polyester film with a reflective aluminized mirror coating on upper side), which is well protected inside. By inflating the air pillow, Airlight is able to create a near-perfect parabola at a lower cost compared to companies who need to manufacture highly precise mirrors. The air pillow also protects the mirror from dust and dirt and can maintain its shape under heavy wind loads. 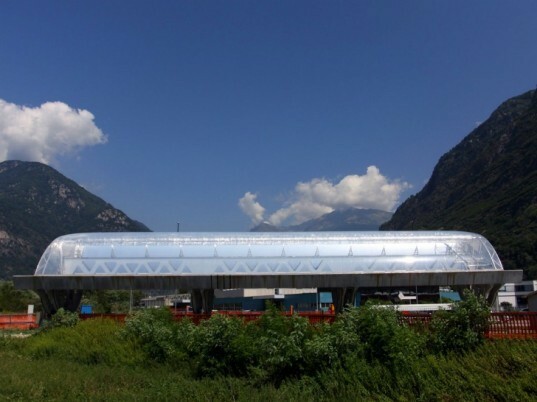 The ETFE foil has self-cleaning properties, which means less maintenance for the operating crews to keep the system clean, further increasing the energy efficiency. More views of the mirrored air pillow. Airlight envisions these CSP systems combined with agriculture and rainwater collection.